MOSCOW (Reuters) - Nigerian fans cheering on their national team in Saturday's World Cup match against Croatia will be missing an important item in their supporter's toolkit: chickens. Live chickens are sometimes seen at soccer matches in Nigeria where fans paint them in the green and white colours of their national flag before holding them aloft and leading crowd chanting. 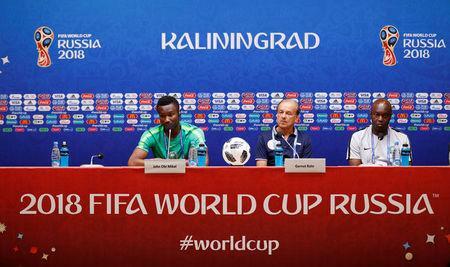 But officials in the Russian exclave of Kaliningrad, where Nigeria will take on Croatia on Saturday in their first outing at the World Cup, have said animals will not be allowed in the stadium. Andrei Yermak, Kaliningrad's minister for culture and tourism, said that whilst there had been no official requests to do so, some Nigerian fans had asked if it would be possible to bring chickens to the match. "It was explained to the fans that according to safety regulations, it is not permitted to enter the stadium with live animals," he said in written comments to Reuters on Friday. Nigeria's soccer federation and the Nigerian embassy in Moscow were not immediately available for comment. Russia's Interfax news agency had earlier quoted Yermak as saying local authorities would still help Nigerian fans get the most out of the tournament. "We will of course advise them where to buy a chicken," Interfax cited him as saying. "We are ready to meet the most eccentric requests."